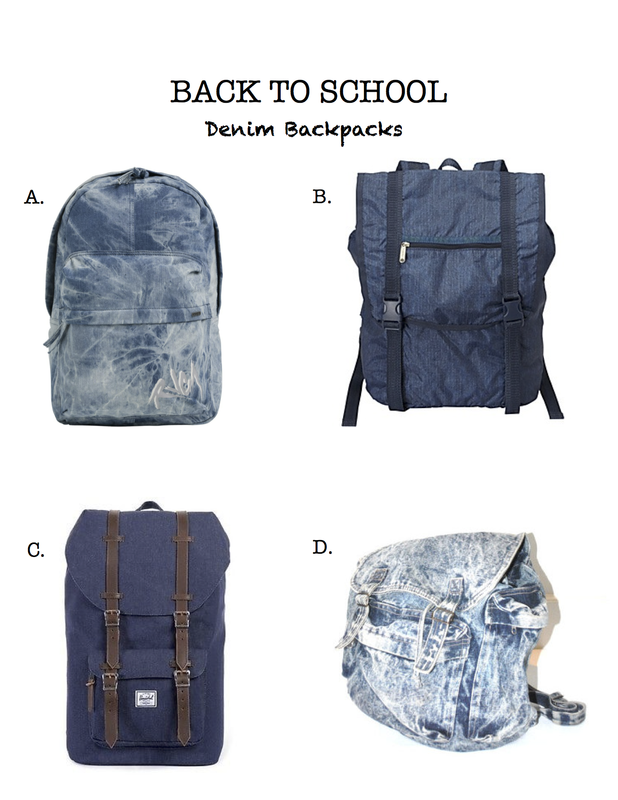 Heading back to school in style with one of our favorite denim backpacks. A. Rvca Scout Denim Backpack Womens, Swell, $49.50. B. LeSportsac Journey Backpack, eBags, $116. C. Little America Backpack, Herschel Supply Co., $160. D. Acid Wash Denim Backpack / 80s Surfer GRUNGE Oversized Slouchy Book Bag, onefortynine vintage, $79. This entry was posted on Saturday, August 23rd, 2014 at 11:20 am	and tagged with back to school, backpacks, bags, Denim, eBags, Etsy, Herschel Supply Co., LeSportsac, Little America Backpack, onefortynine vintage, Rvca, Swell and posted in Fashion. You can follow any responses to this entry through the RSS 2.0 feed.